Iraq: ICRC camera drone captures damage in Ramadi Homes, schools and hospitals crumbled to rubble shown in dramatic scenes captured by an ICRC drone camera. Chilling aerial footage of Ramadi, a once bustling city in central Iraq, has captured the extent of destruction caused by war. In late December, Iraqi forces, backed by US air strikes, announced the recapturing of Ramadi, which had been lost to the Islamic State of Iraq and the Levant (ISIL, also known as ISIS) group in May 2015. The US-led coalition carried out more than 600 air strikes in the area from July to December last year. A new six-minute clip, released by the International Committee of The Red Cross (ICRC) shows homes in Ramadi turned to rubble, along with flattened school, destroyed hospitals and damaged ambulances. “Rare aerial footage gathered by ICRC shows the once prosperous Ramadi in central Iraq now in tatters – a ghost town,” the ICRC said on Monday. Half a million people once lived in Ramadi, the capital of Anbar province. It is difficult to spot one person in the footage, which was captured by a camera drone last month. “Explosive remnants of war are scattered across the city and most people are too afraid to return to homes. It will take months, if not years, to make the city safe again and to rebuild homes and damaged water and electric systems.” the Geneva-based humanitarian organisation said. As the Islamic holy month of Ramadan comes to an end, ICRC President Peter Maurer called for action by politicians and groups. “The people need leaders who believe in humanity; who protect, homes, schools and hospitals; who protect civilians and treat people they capture with respect. Civilians began fleeing Ramadi in 2013 when ISIL started moving in and tensions escalated. The exodus continued for years. More than 80 percent of the city is in ruins after the fighting. July marks just over two years since ISIL captured huge swathes of Iraq’s western provinces after the army retreated. The armed group’s advance slowed soon after and both Iraqi and Kurdish Peshmerga forces have slowly clawed back territory. Under bombardment from the US-led coalition ISIL has lost Tikrit, Ramadi and, most recently Fallujah, to Iraqi government forces. ISIL still controls Mosul, Iraq’s second biggest city. 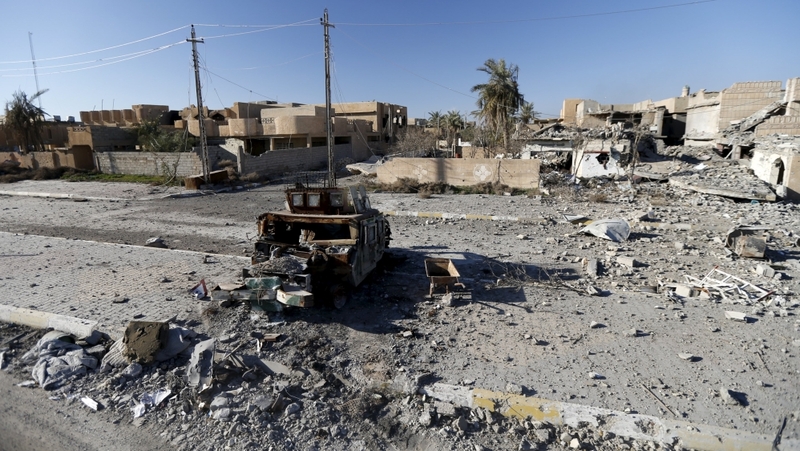 In March, the UN described the damage done to Ramadi as “staggering” and worse than anywhere else in the country. UN analysis of satellite imagery in February showed nearly 5,700 buildings in Ramadi and its outskirts had been damaged since mid-2014. Almost 2,000 had been completely destroyed. Officials said the train station, main hospital, 64 bridges and much of the electricity grid had been ruined.